Newspaper media critics and the radio and television personalities they cover have always had an interesting interaction. On one hand, those in radio and television want the free publicity given to them by these critics. But, when a story doesn’t meet to their satisfaction those radio and television personalities are the first to point the finger of unfairness. Hey, I feigned outrage numerous times. I’m as guilty as anyone. The truth is we need each other. It’s no different than how Hollywood stars need paparazzi and the National Enquirer we look through at the Kroger checkout. The really good newspaper media critics, like Alan Pergament of the Buffalo News and Chicago’s Robert Feder understand their markets, its personalities and most importantly their market’s heritage and place in broadcast lore. Few cities are as rich in broadcast history as Cincinnati. The broadcasting community here gave us Doris Day, Red Skelton, Rod Serling, Jean Shepherd (“You’ll shoot your eye out, kid.”), Al Michaels, Ruth Lyons, Bob Braun, Jerry Springer, Powel Crosley, Nick Cloney and radio’s legendary Randy Michaels. The list goes on and on. The keeper of that history and legacy was John Kiesewetter of the Cincinnati Enquirer, that is until last week when he left the paper as it “redeploys its resources.” Such pleasant corporate speak isn’t it? So sanitary. 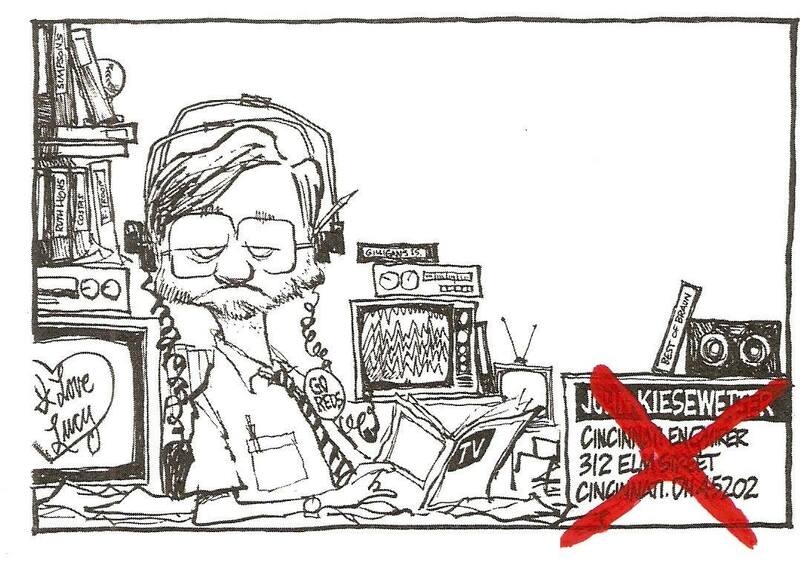 What a shame and what a loss to Cincinnati’s media community. Now there’s no one, like John, who will even begin to understand the sacred nature of broadcasting in Cincinnati. No one to keep the historical record of media in Cincinnati. Pulling the curtain back on my years in Cincinnati, I really liked John and respected him for his understanding of broadcasting’s importance in the Queen City of the Midwest. I respected him for being our industry’s scribe and for his dedication to keeping the historical record of broadcasting in Cincinnati. Let me give you an example of John’s understanding and admit to something I was totally wrong about. The end of summer “Riverfest” on Labor Day weekend is an event that hits deep at the core of what makes Cincinnati such a great place to live. It’s an event that gathers and galvanizes our region’s people, whether they live in Ohio, Kentucky or Indiana. It’s about our proud culture, work ethic, spirituality and the connections we all share. It’s a way for our community to say goodbye to another preciously short summer with a final party, a half a million strong they say. Years ago, this was the event everyone talked about and looked forward to as spring gave way to summer and summer headed to its conclusion on Labor Day. The crescendo was the WEBN Fireworks, once a 30 minute fireworks finale that lit up the Ohio River in downtown Cincinnati and deafened those who attended for days. But, if we’re honest with each other the fireworks just doesn’t have the buzz it once did. It doesn’t have that word of mouth or anticipation. With less people, with less experience and less people who understood the importance of the fireworks to the region, the wrong fireworks soundtrack was broadcast on WEBN in 2011. There were technical reasons. But, many times technical reasons are just excuses for someone screwing up, management not planning and generally being unprepared should a “what if” moment happen. The morning after that fireworks show I went on 700WLW and start critiquing John’s critique of the screwed up fireworks show. Wrongly, I was sticking up for our sister station and trying to make the messenger the bad guy. In retrospect, truly foolish on my part. John couldn’t have been anymore correct, as he understood how important that annual fireworks show is to Cincinnati. As a life long resident he channeled the abuse of trust displayed that September night to his readers. He understood the importance of the fireworks better than most left running the show at WEBN. John was the gate keeper and protector of Cincinnati’s broadcast heritage that day. In fact, that may have been the day I realized his importance to Cincinnati’s broadcast community. Comically, John has been posting on Facebook what he’s been doing during his first few days of unemployment, as he makes his way through a “honey-do” list. I want to publicly thank John for the coverage he gave all of us in Cincinnati radio and television, past and present. John, you did a great job and will never be replaced. Thank you for being the one who documented broadcasting and media over your many decades with the Cincinnati Enquirer. And to my brothers and sisters in radio and television, without people like John, who kept the flame burning brightly for broadcasting, our industry will become a much less lustrous place to perform our craft. He walked right into that one, the time you ridiculed Kiesewetter for calling Doc Thompson, ‘Doc Johnson’ and insinuated something about his personal habits. Another recent example is Milwaukee’s Duane Dudek, who took a buyout from the Journal Sentinel a couple of months ago. While his beat was a bit different (including movie reviews), he did make it a point to also cover radio and TV news–including some items about local broadcast history. Post-buyout, he’s started a personal blog–at, yes, http://www.duanedudek.com. The newspapers in Detroit axed John Smyntek (Free Press) and Tim Kiska (The News)… Both great guys.